Hey, Oh HEY! Hi there, Hellooo. Excellent intro, I know. Now, I'm gnna be honest, I'm writing this post as I go. Literally, as you read this now....I'm typing this and I have no idea what is going to happen next. The excitment is almost too much to handle. This is just one of many forms of procrastination that I am testing out at the moment. I am currently sat in the library, in the orange computer room, selfishly taking up a computer that could be used by some one who actually wants to do well their degree. Don't get me wrong, I do want to do well my degree, I'm just playing a nasty trick on myself to see how long I can not do anything until it gets to the point where I am forced to stay up all night and not see anyone. I should be doing one of three things, 1) editing an essay I finished yesterday, (Sometimes, i'm motivated... but mostly i'm not.) 2) Starting an essay due next week, 3) Starting the other essay due next week. So as you can see, there is quite a lot on the agenda. But it's not time for that yet, (it's only time for that when it will all become too much to handle, and I feel like I'm going to spontaneously combust from the stress of not doing it.) But I've actually just had a thought - I know you're all probably thinking at this point, 'Wow Zahra, how do you do it? How do you procrastinate so well? I'm a risk loving, thrill seeking kind of person, and I could do with some tips on how to procrastinate effectively so that I can achieve that thrill of not knowing if I will pass my degree when it finally becomes too late!' Yep that's what I thought, you can't teach these telepathic skillz you know. 1. Know exactly what it is you need to do and how long you have to do it. This way you can ensure that you achieve the optimum level of thrill and stress. 2. Make sure that you have many objects on your desk. Many objects are good. This can include, anything from mobile phones, soft toys, any form of stationary (blu-tack is a favourite of mine), a harmonica etc. 3. Try to ensure you are sitting next to a large window, or in a room where there is a lot of activity and noise. 4. Internet access is a must, and try to make sure that you have some form of social networking site up AT ALL TIMES. 6. Finally music. This is an essential and I find Spotify and Youtube are useful tools to assist in this form of procrastination. 1. Facebook/ Twitter. Boring, I know, but I think the old social networking nugget is a classic. It would be rude not to include it. 2. Reading blogs about crafty things which I never get round to making. I especially enjoy A Beautiful Mess and The Gluegun Girl in case you were wondering. 3. Looking for laptops online - I need a new laptop. Or really any form of online shop. Ebay is a great one as it ties you in when you've bid on something! So there we have it, and you know what, after writing this having wasted a good half hour, i'm already starting to get that nervous panicky feeling! Excellent. Job done. 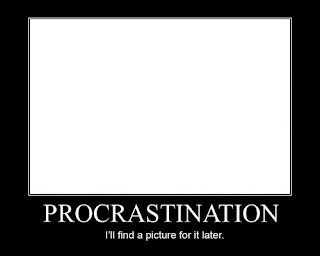 So happy procrastinating, enjoy the thrill! ATTENTION: Please ignore everything that has been written in this post. It is not funny, it is not clever, and it is not cool. I will not be held responsible for any consequences that may follow if the steps above are followed. Stay in school kids.